Specially designed for the B15 Spec-V, 2JR introduces our Full Race Delrin motor mounts for the front and rear of the QR25. All of the engine's torque load gets applied to the front and rear mounts and no OEM or ES/Prothane mount can keep the motor in position like our mounts. Made from solid delrin for extra durability / long life and utilizing a tapered 2 piece design for easy install. These are the only mounts that will keep your motor in rock solid during hard acceleration. Designed for heavy street and competition use. Combo your order save an additional $10 with our Delrin Crossmember Bushings, staggered for front and rear mounts at the frame. Installs in 15min. Specially designed for the B15 Spec-V, 2JR introduces our Full Race Delrin motor mounts for the front and rear of the QR25. All of the engine's torque load gets applied to the front and rear mounts and no OEM or ES/Prothane mount can keep the motor in position like our mounts. Made from solid delrin for extra durability / long life and utilizing a tapered 2 piece design for easy install. 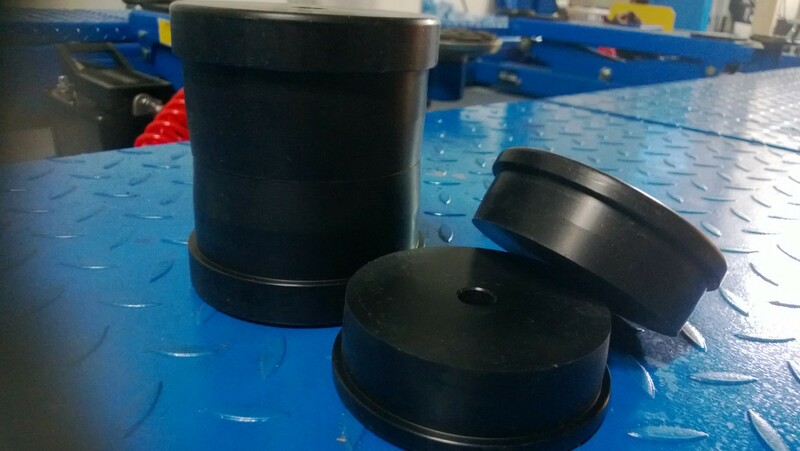 These are the only mounts that will keep your motor in rock solid during hard acceleration. Designed for heavy street and competition use. Combo your order save an additional $10 with our Delrin Crossmember Bushings, staggered for front and rear mounts at the frame. Installs in 15min.